If you're looking for a way to make your Half Square Triangles perfect each and every time...look no further! This very unique and revolutionary ruler is at the "cutting edge" of today's trimming rulers!! Notice the channel in the center of the ruler. It accommodates your seam allowance so the ruler doesn't rock or slide, and "locks in" position for a perfect trim every time!! 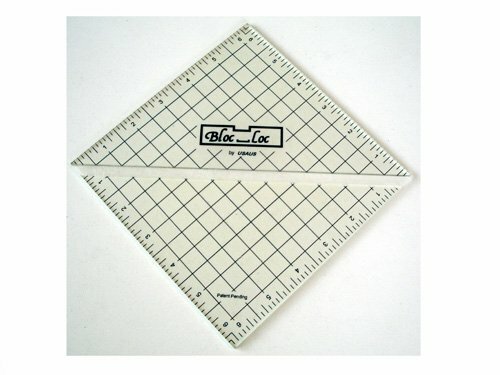 It's the best Half Square Triangle trimming ruler....Bar None!!! My Heartspun Quilts Hints book is the perfect companion for this ruler as it has sizing tables for making your Half Square Triangles larger from 1 inch to 12 inches in 1/8th inch increments, with full instructions on piecing and trimming!! Click here to read more about my Hints, Tips and Tricks book! Please be aware that all sales are final.